The first time I was asked what advice I would give my younger self, I instantly knew the answer. The trouble is my younger self wouldn’t listen. #1. Self-importance makes you dumb. The need to be right closes minds. Self-important leaders defend ideas. 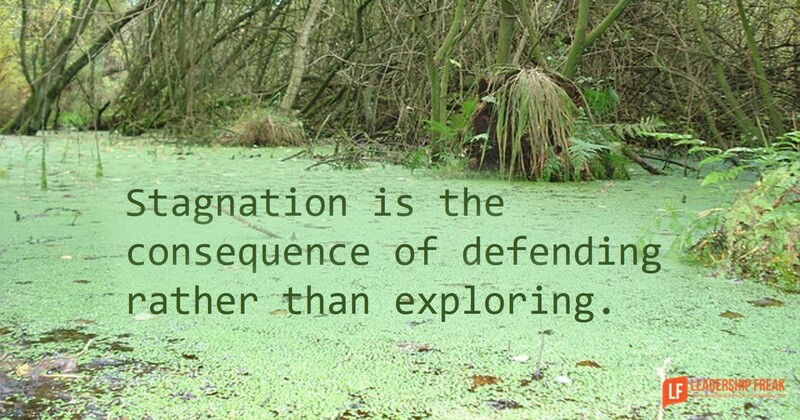 Stagnation is the consequence of defending rather than exploring. You know you’re self-important when you spend most of your time convincing others your right. #2. Self-importance creates stress. The only way self-important leaders can feel important is by being better than others. It’s stressful to be surrounded by incompetence. You know you’re self-important when you’re always above average. #3. Self-importance is exhausting. Leaders are forced to do all the important work, when they’re the most important people at the table. Self-important leaders don’t delegate. It’s exhausting when you do everything better than others. When you’re self-important, leadership is about what you do. #4. Self-important leaders disconnect. No one really understands you when your a self-important leader. You isolate yourself to get away from all the incompetent, disappointing people who surround you. #5. Self-important leaders judge others and exempt themselves. When you’re self-important, others need help. You don’t. Growth ends when you’ve arrived. Just recently, I realized how to say, “Get over yourself,” in a positive way. The leader’s importance is found in making others important. Every time you make yourself more important than others you lower the potential of those around you. How might leaders navigate tensions between ego and humility? One of your better posts this month…a couple very impactful quotable lines…thank you! Stop being so critical on yourself. Exercise self-compassion. This is a great Friday post! I am grateful you changed the sentence into a positive one. “Show up to serve” is a phrase I really love. “Get over yourself” not so much! Learn to really hear and listen to your inner voice; it is there to serve you. The hair on the back of your neck helps you sense danger; don’t ignore it. Ouch. This is one of you posts where I feel like you’re speaking only to me. Good tips to keep in mind as self-importance only encourages that “lonely at the top” feeling! Thanks for the post! “Get over yourself.”…The trouble with the question is my younger self wouldn’t listen. That’s completely true. All the wisdom you can offer is only impactful IF it is taken to heart and acted upon. Which comes from that ‘lack of self-importance’. Good stuff. Great post today.. You’ve captured the essence of service/offerings they are receiver centered, not self-centered..
“Show up to serve.” How powerful! Years ago in a leadership seminar we were asked to give a one-word answer to “What would you tell your younger self?”. I chose “Listen!” Great post! As a leader it can be hard to get over yourself. What the team is and what it is doing is mostly from your leadership skills. Not saying I did it but that I was able to bring out what I saw in them. Its hard to not say “if not for me” “look at this” and other like statements. The issue is when it all falls apart do we do the same? I know I do. Thus the downside of ownership. I wish I could tell my younger self to just wait. Thanks Walt. We should distinguish between self-importance and self-confidence or skill. You remind me that being skilled doesn’t mean we have to be full of ourselves. I would tell my younger self that it’s not about growing myself it’s about growing others, pulling them along and helping them realize their real potential. When I do this I end up growing alongside them. Thanks Jaime. Perhaps we should grow our ability to grow others? Love the idea that we grow as we help others grow. It’s like the teacher learns more than the student. I always think of leadership in the context of Simon Sinek’s Golden Circle, which is a set of three concentric circles that represent What, How, and Why (moving outside in). This has been the framework of my own leadership, and my Why for leadership is exactly your solution to self-importance: Serve. To serve your “subordinates” is the only purpose of leadership, and that’s the lens I use when making leadership decisions. So I agree. Serving will definitely fix problems caused by self. Thanks Nick. Wow. You distilled four words into one. Bingo! Dan, thank you for investing in us. Your question about navigating tensions between ego and humility reminded me of my favorite definition of humility: “seeing things as they truly are.” I wonder if such a view could allow for a high view of the ourselves even as we also embrace a high view of others and the opportunity to serve. Dan, thanks for this one. I have a personal belief – be the change you want to see in the world, and I , like you, would not have espoused that belief as a you new manager. Now as I coach those in companies I find the desire to invest in others takes time is not ‘fast enough’. In a world of tweets, and Facebook and the internet,I find instant gratification is almost like a drug nowadays. I do find it hard to encourage leaders to take some time, invest, sow the seeds, allow them to germinate and you will have results. But I keep trying…. because I serve as well. Show up and serve, yes! And other advice I’d give my younger self? Take more chances. And, ” Talk less. Smile more”, as Aaron Burr advises the young Alexander Hamilton in the uplifting broadway play, Hamilton.